Just a reminder that the BoldHeartMama Wisdom Deck Giveaway closes tomorrow night! I hope that you win! I know we can all use positive pretty things in our lives right now. 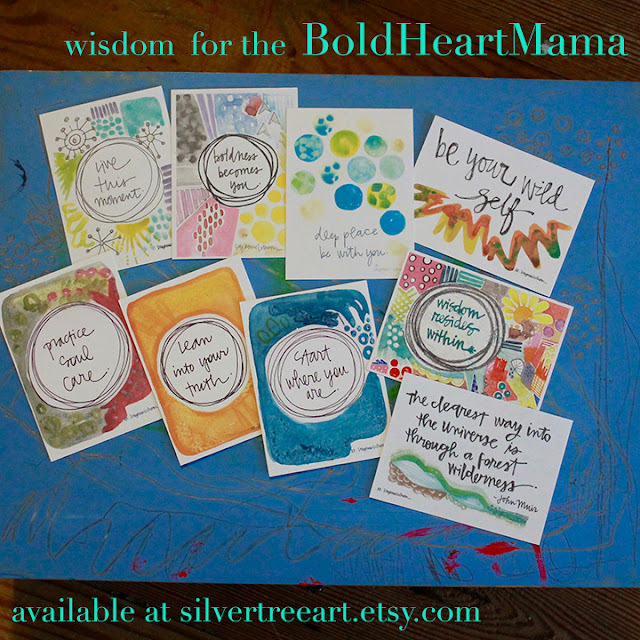 I love love love Suzanne L. Vinson's Wisdom Card decks, which can be used as reflections, reminders, mantras, encouragements, blessings, affirmations, and more. Share them with a friend, hang them up where you can see them always, tuck them away for just the right moment. I have a deck, now you can have a deck too! To enter please leave a comment here or in the original post to share your current favorite self care practice. That's it! So easy. The contest ends tomorrow night!! For additional entries please "like" Suzanne's Silver Tree Art Facebook page, and/or follow her on Instagram. If you already like or follow her feeds, that counts, so leave an entry! Thank you Katie!! Yes to all of those things, you are so strong I wish we could workout together every week! You always inspire me in the kitchen too. I just learned about wisdom decks! Super intriguing. As for self-care , I am putting a great deal of focus into healing right now but one of the biggest things has been to turn off electronics by 8:30 and sleep by 9. I haven't been perfect but the shift seems like a good thing even if it requires some tough love. For more fun self-care, I treated myself to a pretty journa and new planner at the start of the year. Hi friend! :) Your quest for adequate sleep over the years and your acknowledgement of the importance of it for sanity and health every day has always made me think twice, because sleep is one of the easiest things to skimp on when the hours in the day never feel enough. This is something I've been thinking about lately too...I find it so hard to get to bed at a reasonable time. I've been trying out different ways to trick myself but so far they aren't working, ha ha! Touch love is right. Paper products are always a pick me up, I agree! Love her art! Two things I try to do is eat a balanced diet and visit lots of local coffee shops where I sip a warm drink while my creativity flows! This is where I get excited and plan for the future!